AutoHrvatska d.d. is a company which provides professional services related to the sale of vehicles, spare parts, tyres, tools and service equipment and the organization of a service network for personal and commercial vehicles. 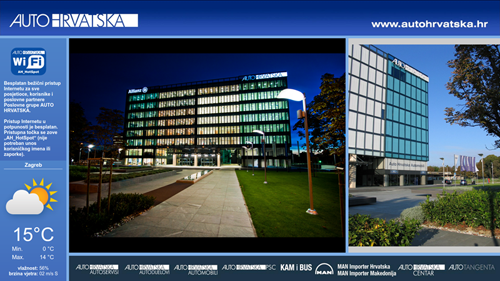 The company was founded in 1952 and up to this day it still has a series of branches all over Croatia. The client wanted to install a system which would enable simple information and notifications in its branches. The demand that the client had was that the locations where information and notifications will be displayed must be independent from the central content server in case there is a break in communication but also that all remote locations need to be managed from a single central point. Also, it was requested that the information and notifications that would be displayed, should be easily entered into the system and that the change of data needed to be quick and simple. InformAsYouWish system enables the replication of content to remote locations and in case of a break in the communication, the content from the local copy is displayed until communication with the central server is re-established. As You Wish system solved the request that the information and notifications be easily entered and that data changes be quick and simple by using its SimpleAdmin interface, thus fully meeting the client’s needs. The client noticed that the solution, besides what was requested, also offered additional options which simplify the management and operation of the system, such as reviewing information before publishing, reviewing the entire schedule before displaying it on screens, the ability to adapt the duration of specific information in the schedule, etc. A special design was also made for the client, completely adapted to the client’s visual identity. By installing this system, AutoHrvatska enabled simple information and notifications. With its SimpleAdmin interface Inform As You Wish system enabled simple entry of information and notifications and quick change of data.